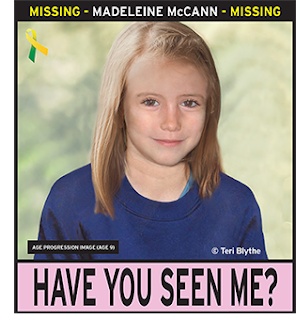 Today is a little girl's birthday who should be celebrating her 10th birthday (12th May) and probably doesn't know because she was snatched from her parents nearly 5 years ago and has not yet been found. Madeleine McCann disappeared on the evening of Thursday, 3 May 2007. She was on holiday in the Algarve region of Portugal with her family. She went missing from an apartment, in the central area of the resort of Praia da Luz, a few days before her fourth birthday, and has still not been found. I can not think about the pain Madeleine's parents and family go through on a daily basis. Waiting for answers, living in hope that the phone will ring to tell them that there beautiful little girl has been found. ONLY the public can help. Where were you on the evening of Thursday, 3 May 2007 and the days after it? Did you ever witness anything that may be able to bring this little girl back to her parents and her family? 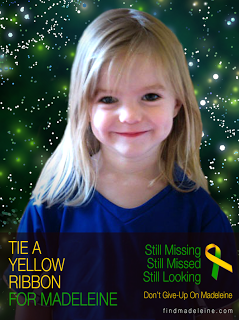 Have you seen this little girl recently? If you see anything please pick up the phone. Imagine if it was your own child that had gone missing. A Blog Linky is also being hosted by www.britmums.com to track everyone taking part in the link up. This was set up by AMummysView and Tea and Biscotti. If you are able to spread the word to, please get involved. Its been six years. I hope shes found one day them in ohio who were locked in the basement for ten years really give hope. I do believe shes out there somewhere. You can't imagine the despair of 6 years of not knowing where your child is. The case in Ohio really does give hope. Thank you for participating in #Blogging4Madeleine - let's hope we can help to bring her home. I hope one day she is found. Her mother was a GP at my doctors at one time. It is so sad. Like the others said, the case in Ohio must give her parents some hope. So young and so vulnerable, all the children from all around the world still missing. I hope they find their way home soon. i really do hope they find her, though after so long you can only fear the worst.